What is it that makes a food appealing? Smell, texture, and many other factors play a role. But one evolutionary hang-over forgotten about is its colour. When living in the jungle the colour of a food can be a good predictor of its caloric content, with red food generally having more energy in it. As such, most primates show a preference for a red meal. In fact, some think that they even evolved better vision to easily spot this red deliciousness. And we evolved from primates. In fact, we’re technically still primates. New research reveals we inherited this preference for a red food from them. 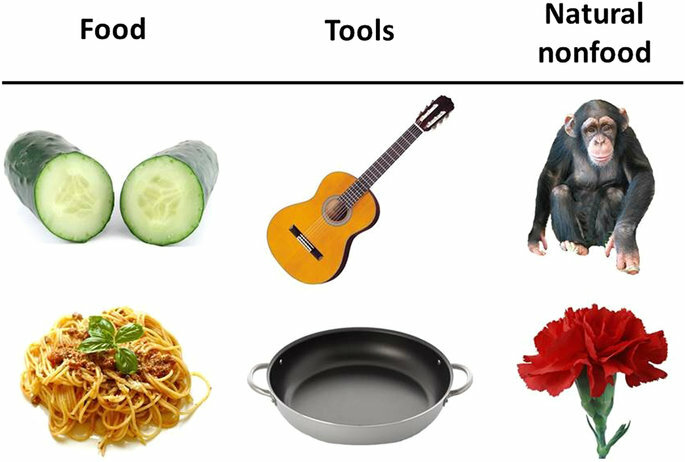 Red items were ranked as having higher calories and generally being tastier than their green counterparts (which other primates tend to avoid as they have a lower calorie content). Most primates have trichromacy, AKA the ability to see three colours. In their case its red, blue, and green; each sensed by a different cell in they eye. This grants them enhanced colour vision compared to most mammals, who are simply dichromatic (see two colours). Although it should be noted that primate trichromacy isn’t the best colour vision out there. Many reptiles and birds have an extra receptor, granting them the ability to see four colours. Of course, when talking about eyes its easy to spot something distracting (see what I did there) and there’s tangents abound. Like how some reindeer can see extra colours than even primates, likely as an adaptation to the dark. And the mantis shrimp has a whopping 16 types of colour receptor, which is just the start of their awesome eyes. But I digress. Due to the prevalance of dichromatic vision in mammals, it seems likely that distant primate ancestors had similar vision. But early in their evolution they developed trichromacy. What drove this development? It has been linked with social behaviour, allowing primates to better spot skin flushes and other indicators of the emotional state of their conspecifics. But perhaps one of the biggest advantages to this improved vision is that you can better spot high calorie food. In the typical primate environment (jungle) the redder a leaf or fruit is, the more calories it contains. And the greener it is, the less. Accordingly, that extra sensor in the primate eye makes them extra good at spotting the reddest and greenest items. So they can seek it out (or avoid it) as necessary. As always, it’s worth noting evoltuon is a complex thing. Whilst people might point to food as a key driver of primate evolution, that is not to say it’s the only factor involved. Many other driving forces likely influenced the development of primate vision. As you might expect, most primates show a preference for red food; particularly when offered a green alternative. This further supports the link between their colour vision and food, but also raises an interesting question. Does this bias continue to influence our psychology? We are after all primates, complete with trichromatic vision. And it wasn’t so long ago picking out red fruit would be key to our survival. So some researchers conducted a study to investigate this possibility. They presented participants with food of varying colours to see which they preferred. They also presented them some non-food images as well, to ensure they weren’t just detected some general preference for a particular colour. Sure enough, we kept in line with our primate heritage. People ranked the redder food as likely to have a higher calorie content and generally be nicer. Crucially, they showed this preference just for food. This clearly isn’t some natural draw to red in general, but to red meals in particular. This could lend further support to the idea that our advanced vision did evolve to help with our food getting. Which is a somewhat ironic twist of fate. We’re always looking to primates to shed light on our evolution. In this case, it might well work the other way round. Foroni, F., Pergola, G. and Rumiati, R.I., 2016. Food color is in the eye of the beholder: the role of human trichromatic vision in food evaluation. Scientific Reports, 6. Humans are physically and psychologically bloodthirsty (we ARE what we eat and watch). Does it have to be any more complicated than that? Given that this red food preference seems to proceed routine consumption of meat, then it looks like bloodthirstiness alone is not a sufficient explanation. “light of evolution” lmao, are you trolling?